With an ultra-slim design and superior impact protection, Presidio GRIP is a line of premium grip iPhone cases unlike any other. It’s designed like a fortress, with a protective perimeter to keep shock away from your iPhone. Raised rubber ridges provide a no-slip grip on Speck Presidio Grip iPhone cases. 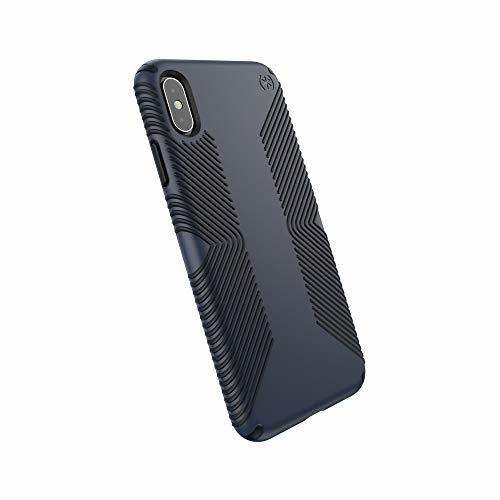 Presidio GRIP features the IMPACTIUM Shock Barrier, Speck’s innovative new shock-suppression technology that protects your device without adding unnecessary bulk. IMPACTIUM is a dynamic shock-absorbing material lining the interior of the case that absorbs and disperses shock from impact. IMPACTIUM absorbs 52% more shock from impact than traditional TPE rubber. Presidio GRIP is drop tested from 10 feet multiple times by a third-party laboratory to test its superior protection from an extreme height, so you can be confident it will hold up to everyday drops. All Speck cases, including Presidio GRIP, are lab tested for scratch resistance, chemical resistance, and precision fit. All Presidio cases come with a lifetime limited warranty. ☛ To ensure that Speck Presidio Grip offers the ultimate protection for your iPhone, it has been dropped from a height of 10 feet multiple times by third-party laboratories. ☛ IMPACTIUM is an innovative dynamic shock-absorbing material that lines Presidio Grip cases. ☛ IMPACTIUM raised bezel guards screen from direct drops onto phone face and prevents damage when lying flat. ☛ We've optimized the design to create the slimmest dual-layer case Speck has ever made, while improving protection. ☛ New matte finish resists scratches and offers a modern style with a range of elegant and vibrant colors; Presidio Grip incorporates raised rubber ridges to provide a no-slip grip.